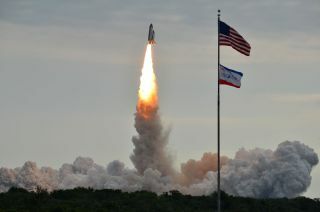 CAPE CANAVERAL, Fla. — In a bittersweet moment for thousands of space fans and NASA workers, the space shuttle Endeavour lifted off for the last time today (May 16). But for NASA, there's no time for tears. The dedicated engineers, astronauts and other officials close to the program will have to wait to mark the achievement of Endeavour's 25th and final launch, because for now, there's work to be done. It's a "very packed mission," said Mike Moses, chair of the shuttle mission management team. "The crews are going to be very, very busy, very challenging." "The real tribute is, I really challenge the team and challenge all of us to treat each one of these missions as much as we can, just like a regular mission," said Bill Gerstenmaier, associate administrator for space operations. "I want it to feel like this isn't the last mission. They've done a tremendous job of being able to stay focused, watch what's going on. I feel real privileged to be considered a part of this team that's pulled this off. It's not easy." The shuttle's main payload, the $2 billion Alpha Magnetic Spectrometer, which will search for cosmic ray particles to probe the mysteries of dark matter, antimatter and strange matter, is a fitting final mission for the well-traveled orbiter, officials said. "This is a really world class instrument," Gerstenmaier said. "It fits very well with space station. I think this is a pretty special way to cap this sequence of flights, to bring the AMS up on this flight." After completing their final missions, Endeavour, Atlantis and their sister orbiter Discovery will be sent to museums around the country for public display. Endeavour will head to the California Science Center in Los Angeles, while Discovery will go to the Smithsonian National Air and Space Museum's Udvar-Hazy Center outside of Washington, D.C., and Atlantis will stay here at the Kennedy Space Center's Visitor Center. Once NASA finishes flying the space shuttles, the agency will shift its focus toward flying missions beyond low-Earth orbit to an asteroid and Mars, as well as continuing to operate the International Space Station to at least 2020. "In the near term, the focus is really on station, to utilize the heck out of station and at the same time build a concrete plan on how we're going to get out of low-Earth orbit," Gerstenmaier said.